Farmers thresh paddy rice in Laos. 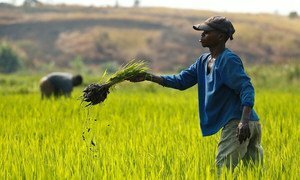 World cereal production in 2016 is set to reach 2,521 million tonnes, just 0.2 per cent below last year’s and the third-highest on record, the United Nations Food and Agriculture Organization (FAO) said today. According to the FAO Food Price Index released today, overall food prices rose 1 per cent in March on the month, as soaring sugar prices and continued increase in palm oil quotations more than offset plunging dairy product prices. The trade-weighted index tracks international market prices for five key commodity groups: major cereals, vegetable oils, dairy, meat and sugar. Its decline over the past year reflects ample food supplies, a slowing global economy and a stronger US dollar. Cereal prices fell slightly in March, marking the fifth straight month of decline, amid a favourable supply outlook in the new season. Sugar prices rose 17.1 per cent from February, reaching its highest level since November 2014. The sharp increase reflects mainly expectations of a larger production deficit during the current crop year, but likely also reported higher use of raw sugar for the production of ethanol in Brazil. Vegetable oil prices also rose notably, jumping 6.3 per cent from February, as international palm oil prices surged on the back of prolonged dry weather in Malaysia and Indonesia, by far the world main producers. Soy oil prices were stable, while sunflower and rapeseed oil prices declined. Dairy prices dropped 8.2 percent to its lowest level since June 2009, led by plummeting butter and cheese prices. Meat prices were broadly unchanged from last month.